Want a solar system big enough to do the work, without having to drop a mint all at once? Yes, they really do exist. Today’s article is brought to you by Scott Bishop, the better half of Kellene--The Preparedness Pro. While the article is lengthier than most, there really wasn’t a good “break” point. Besides, I’ve also got to include a follow-up piece on how to assemble the solar panels. Enjoy! So many people want an alternative energy source for backup power, emergency power, etc, but the made-for-you systems are so expensive that few can readily afford them. (One company that has recently sprung up provides a solar solution, at a cost of over $750, which includes a 30 watt solar panel, a 400 watt inverter, and a 350 Whr – that is, it will provide 350 watts for one hour – Power Pack, which contains a small charge controller and battery. Adding each additional 30 watt solar panel costs another $300, each additional 400 watt inverter is $120, and each additional Power Pack is a whopping $350. Though great for someone who simply wants to power a laptop for a few hours, this system would power a very small half-height fridge for less than an hour or two at the most – not a good solution for the long-term. On the positive side, this type of system is great for portability, but that isn’t my aim for a true alternative or emergency backup power source.) Adding insult to injury, few know how to put a decent alternative or emergency power source together that will power more than a laptop or cell phone. So, having built them before, I decided to build another solar power system to document how I would go about it, hoping that others would see how easy it can be to build a great system at a much lower cost than store-bought. This article will include the basics of building a system, and future articles will include more in-depth information about the nitty-gritty details. There are just a few simple building blocks to a solar power system; the solar panels, the charge controller, the battery bank, and the inverter. Each solar panel consists of several solar cells. Though solar cells vary in specifications, meaning how many volts, amps, and watts each will produce, this is not a place to skimp since your solar panel real estate is limited. So, I purchased tabbed (I’ll explain this later) 6” x 6” solar cells from www.solarwindsusa.com. These produce .6 volts and 8 amps each, which equates to 4.8 watts of power per cell, and are some of the better solar cells available. (As a comparison, many places cell 3”x6” solar cells that produce .5 volts and 4 amps, which equates to 2 watts. These cells are less efficient, require more work for assembly, and take up more space since you need a small space between each solar cell.) You can buy these solar cells separately or in a kit, which includes some solder, soldering flux, encapsulant, diodes, connectors, and silicone. You’ll be buying that stuff anyway, so getting it in the kit makes a lot of sense for first timers who don’t have it on-hand. The kit for a 250 watt solar panel costs $199.95. Compare that to the $600-$1000 range that you’ll generally find for prebuilt panels on the Internet for the same wattage-rating. The kit does not come with the frame ($50 at Home Depot) or the glass ($70 at Jones Paint and Glass for tempered glass) since it is cheaper to buy these local than to have them shipped. The total power produced by your solar panels determines how fast you are able to recharge your battery bank after a day of usage, so they have to be sized to how much power you intend to consume over the long haul. I’ll come back to the panels a bit later. The charge controller sits between the solar panels and the battery bank and simply controls the voltage and amperage being supplied from the solar panels and applied to the batteries. In short, it makes the necessary conversions between the solar panel output and the battery input. I purchased a Morningstar Tristar TS-60 (60 Amp) from www.ecodirect.com for $174.95. That is probably overkill for most people, and you can get a good 30 amp charge controller for around $80 if you would prefer, but I intend to build a decent-size system, so I went with the larger charge controller. When purchasing a charge controller, a lot of new terminology comes into play – mostly PWM (Pulse Width Modulated) and MPPT (Maximum Power Point Tracking). PWM charge controllers maximize battery capacity and life and are quite a bit cheaper, while MPPT charge controllers maximize the energy produced by your solar panels to get every last ounce of energy into your batteries. Because battery-cost is so high, I chose the PWM charge controller for this system. The batteries are one of the more expensive parts of the system, so I buy them used from places that get them out of wind-turbines after 1 to 2 years of use. Doing so gets me a great battery that is good for about another 8 years while paying about one-fifth to one-fourth the cost of a new battery. 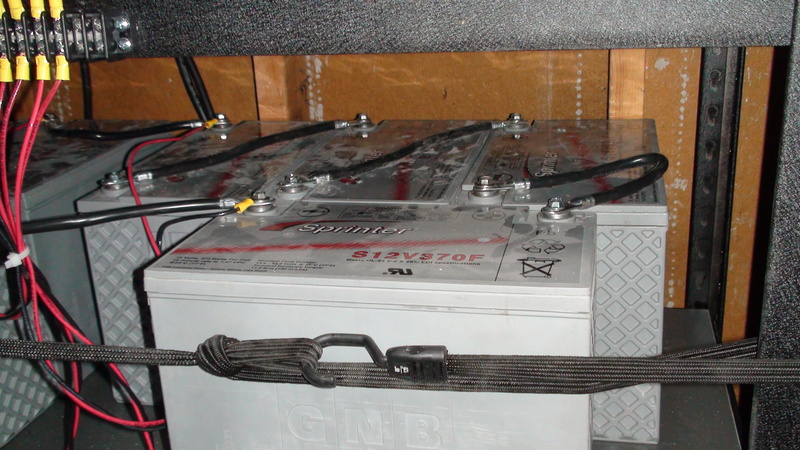 I like the GNB Sprinter S12V370F batteries because they are a heavy-duty, deep-cycle, AGM battery that is made for the type of system I am putting together. These batteries produce 370 watts of power, per cell (six cells in a 12-volt battery), for a period of 15 minutes, which means that each battery will produce 555 watts of power per hour (i.e. 370 watts * 6 cells / 4 fifteen-minute periods). They retail for around $400-$450 each, but I typically get them for about $75-$90 each. Depending on the system you build, you may need to buy them in sets of two or four, rather than just singly. 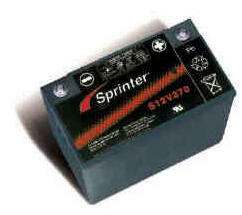 The total storage capacity of your battery bank determines how long you can run various pieces of equipment. I’ll come back to the batteries in a bit. The inverter is a critical component that decides how much aggregate power your equipment can consume at a time. They are typically rated in the number of hours that they can continuously produce one amp of current without needing to be recharged. 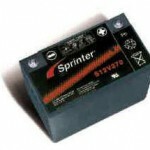 Most inverters sold in stores are very low power inverters, so you can’t expect to run much off of them. As an example, a typical air-conditioning unit might consume 2500 watts of power, while a typical computer might consume 75 watts. Do you really want to spend your precious power on air-conditioning? For some people, maybe, and that’s why you need to decide up-front about how much power you might need. (To get a decent idea of how much power different appliances, tools, etc, use, you can go to any number of sites, such as www.dieselgenerators.com/power.php.) Needless to say, that 75-300 watt inverter you were thinking of buying at Target or Kmart isn’t going to do you much good in a serious system. Instead of buying an inverter from a store, I look through the classifieds for businesses that are selling used Uninterruptible Power Supplies for computer servers. By doing this, I get more for my money than the typical inverter. 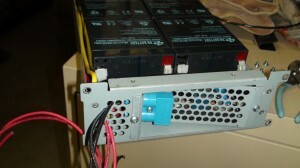 An Uninterruptible Power Supply has a battery bank already in it (though the batteries might be older and near their end of life), it has the ability to charge the battery bank from the wall outlet while power is still on, and it is meant to power higher-end computer systems and servers, which means that it is designed to produce good, clean power rather than the dirty stuff most inverters put out. I like the APC Smart-UPS 2200VA unit. It produces 1980 watts, which is about 16.5 amps at 120 volts (Power equals Voltage times Amperage), which is comparable to one full 20-amp house circuit that would run the refrigerator, a couple of lamps, the microwave, etc, at the same time. This UPS normally retails for about $800-$1000, but I have found them in the classifieds for as low as $150 each, and the batteries were still good. I purchased two of these for this system so that I can put together two full house-type circuits of 20 amps each. That is quite a bit of power. 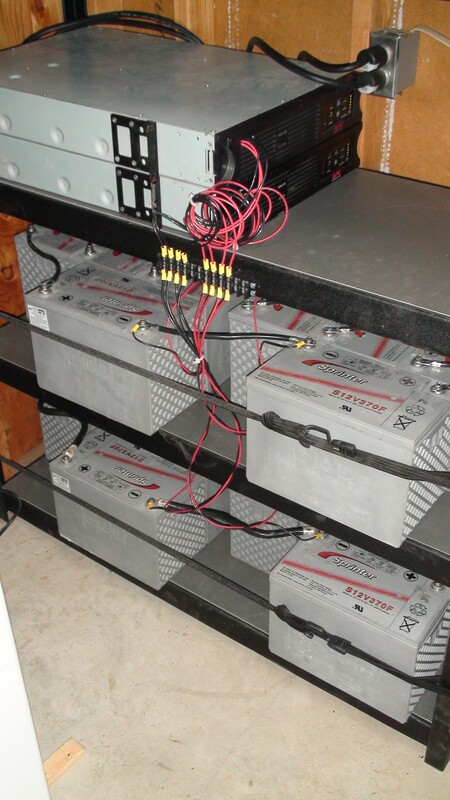 While a typical low-end inverter will tie directly to a 12-volt battery source, an Uninterruptible Power Supply usually configures its battery bank by connecting several batteries in series. Connecting batteries in series (connecting several batteries together in a string – negative of one battery to positive of the next battery – and connecting the starting negative post and the ending positive post to the system circuitry) has the effect of increasing the total system voltage, while connecting batteries in parallel (connecting the negative post of each battery together and the positive post of each battery together and then connecting one of the negative posts and one of the positive posts to the system circuitry) has the effect of increasing the total amperage output. Since Power (watts) equals Voltage times Amperage, increasing either increases the total power (watts) available in the system. By opening up the APC Smart-UPS 2200VA UPS, I find that there are a total of eight batteries (small 25 watt batteries). These batteries are broken up into two sets of four batteries, with each set of four batteries being connected in series (which increases the voltage for each set to 48 volts), and then the two sets being connected in parallel. Since I have to match my battery banks to the internal voltage of the UPS, this means that I have to purchase the batteries in sets of four so that each set of four can be connected in series to equal the 48-volt internal UPS system voltage. I have two of the APC UPS systems, so I decided to go with sixteen total GNB Sprinter batteries. This gives me a total of 4440 watts of power per UPS system (a total of 8880 watts of power between the two systems). By sheer coincidence (there are eight batteries internal to the UPS, and I have decided on eight external batteries per UPS system), I will be configuring the external batteries in the same configuration as the internal batteries (two sets of four batteries each, with each set connected in series, and the two sets connected in parallel). A caution is in order here: 48 is the magic number where voltage is concerned, in that the human skin is resistant to voltage, and 48 volts is the level at which the human skin begins to allow current through to the electricity-conducting electrolytes in the body’s fluids. So, when you are working with batteries in these systems, it is a good idea to wear leather gloves for added resistance. 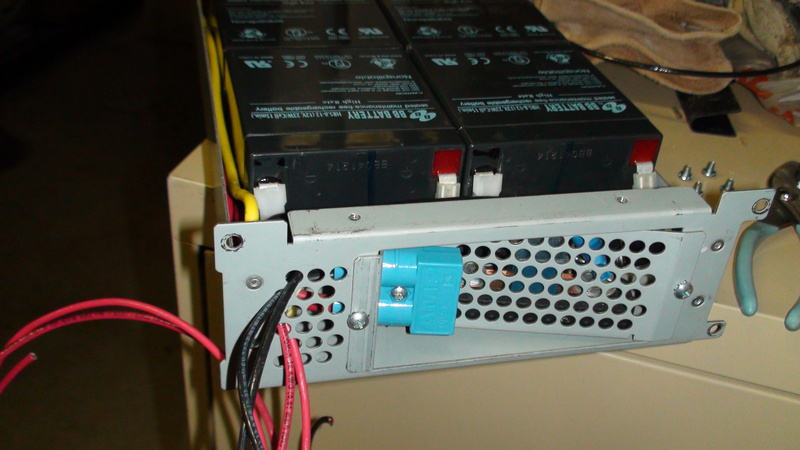 The batteries are connected to each other using a minimum of 4 AWG (gauge) wire in order to handle the potential current transfer between each of the batteries during charging from the solar panels, but 10 or 12 gauge wire connecting each bank of batteries to the UPS system is fine since the system is limited to supplying (drawing from the batteries) no more than 20 amps at a time. At full-power, the Morningstar Tristar TS-60 charge controller would power both of these systems just fine, but I decided to use one for each UPS system (insert standard man-grunt here). The charge controller has a set of labeled terminals that connect to the battery banks. A minimum of 4 AWG wire should be used for these connections since you could have up to 60 amps traveling on those wires. Additionally, the charge controller has a set of labeled terminals that connect to the solar panels. I’ll be using 12 AWG wire for these connections since I am building this system to provide no more than 20 amps per solar panel bank connection. That leaves just the solar panel banks to connect. Each solar panel will provide 250 watts and will be connected in two parallel sets, each consisting of two panels connected in series, which means that each solar panel bank will produce a total of 62.5 volts at 16 amps for a total of 1000 watts per solar panel bank. Notice that this voltage does not have to equal the 48 volts of the battery banks since the charge controller will make the necessary transformations to the voltage levels, and configuring the panels in this manner means that the current being transmitted on the wires from each solar panel bank remains at less than the 20 amps per solar panel bank that I just mentioned. Since panels do not produce at 100% efficiency, I can connect four of the solar panel banks to each charge controller to get a total of 4000 watts of source power to recharge my battery banks each day. That means that I could nearly drain my batteries each evening and still have them recharged during each sunny day. In an emergency, I know I will be consuming much less power than a typical non-emergency day, so this is a pretty good system for my needs and desires. When connecting the solar panels, remember that, when they are receiving sunlight, they are producing energy, so, again, wear gloves and take the necessary precautions inherent with electrical work. You may want to cover them while making the connections. The grand total: about $12,250. That’s a lot of money, right? Yes, but that equates to a little more than my total monthly power usage as it stands right now (with heating and air-conditioning), and that system would retail at about $40,000! And, the brilliant thing is that I don’t have to add all of the solar panels up-front; I can add them one or two at a time over the next year. The same is true of the UPS systems, the batteries, and the charge controllers. To sum it up, you could start with one UPS, four batteries, one charge controller, two solar panel kits with glass and frame, and be into a system that will produce enough emergency backup power to operate your refrigerator, computer, and other odds and ends, all at a cost of less than $1200; and, you would have a system worth about $6,500-$8,000. For refrigeration and so many other amenities during a crisis that I would otherwise have to do without, that is well-worth the time and cost (not to mention the savings!) to me. Someday soon, I hope to have my system built up to the point of not needing the power company at all; is that heresy? This is a system that can be duplicated easily. I can add more inverters or UPS systems, more battery banks, more charge controllers, and/or more solar panels any time I like, to shape the system to my needs – emergency or otherwise. How fortunate you are to have such a smart hubbie. I think my daughter and I would end up doing this because I know my hubbie wouldn’t. Wonderful article, do you rent him out? Thank you for all your wonderful information. Situations in the world are changing so fast you are a wonderful source on information. I have a medically fragile child with special needs. He requires oxygen and a vent at night. This, by far, is my biggest preparedness fear. How to keep that oxygen and vent running? We have a generator. But that relies on gas. I have oxygen bottles but they empty out within hours. Solar is what I've been looking at. But even at $6,000 to $12,000 ....the cost is still totally out of our range. Medically fragile kids are expensive. Like max out a million dollar insurance policy expensive. I'm going to print this out and save it though. Just in case. Thanks for all you do and all you share! You've helped me prepare in the ways I'm able to right now. Tammy and Parker Scott addresses this in part, but finding a lot of these parts USED is a great way to shave off as much as 60% off the cost. Still, if it's a matter of life or death, then I'd definitely focus on how to generate a 2nd income for the household that you can do from home. Tammy, you mentioned you empty out your oxygen bottles in hours. Have you looked into getting one of those units that take oxygen out of the air. A friend of mine got one and it continually makes oxygen. I'm familiar with those too, Tammy, AND Medicare pays for them. They are about $2,100, but it's a heck of a lot easier than replacing canisters! All ya have to do is put water in this little container on the top. The Humless Solar Generator would run it just fine as well. You should mention that if one does get the capacity to go completely off-grid that there is wisdom in being grid-tied instead of completely cutting your power. The extra power you produce will be bought back by most power companies. This will give your account a credit which you can put toward service you may use should you have several cloudy days in a row & utilize your battery reserve. That's actually a great point which he brings up in the part 2 of this. It's one of the many ways to bring in more income into the home. Great article and thanks Scott for sharing with us. Looking forward to the next part. We've wanted something like this for so long and now it's do-able! Bless you and Scott for taking the time to share this information. We have a generator but with gas prices going out of sight, noise etc it's only a very temporary fix. With solar, you can have energy, not be conspicuous and keep a lower profile. Thank you. Your article is the first one that has made the setup understandable to me. The hubs and I are totally on board, but our area is not very sunny, wondering if it would be worth it? Hmmm, one more thing to look into. Thank you so so much for including the links to where to purchase these items! Doing it one set at a time is manageable! Good stuff! Any chance you'll make a video to help out idiots like me? I am very interested in building a home solar system, but we live in central Texas. We have hail storms here fairly often. How do you protect the solar cells from damage from hail storms? Scott and Kelleen, thank you very much for this information about a home system. I have been looking for this information for a long time. Thanks for the article, we are planning to build panels for our farmhouse. A suggestion: in order to get a more accurate quote on how much wattage you will need, why not contact your current utilities provider and ask them how much power you use? That's what we did and it was really helpful. Anyway, great article and thanks again. They are just as resistant as any other surface you have with the exception of steel roofing. Will you be giving greater details on panel frame construction in the future, eg, are you using plywood as a backing plate?? Did you take any pictures of the solar panel assembly process? The solarwindusa site has downloadable instructions but I can't say I fully understand them. The site has a list of videos that might be posted someday but currently there aren't any posted. There is a small panel kit for $56 that could be used to recharge a 12v battery in the field. I'm thinking I'll try that one first since I could use it camping. Thanks for the great ideas! Great Great article. I have just finished reading it overt the phone to a friend of mine. He is going to read it for himself when he can pull over from driving his truck. Thank you for taking the MYSTERY out DIY solar ventures. Wow! What a detailed article. Thank you! I would love to put one of those together. I live in Hawaii where it is sunny year round and energy costs are outrageous. I will definitely have to start small and try this out. That is a great article. I have already scrounged some UPS's for free. Glad to see someone thinking the same thing. Where can you get the ex wind turbine batteries? That looks like a great deal. This system is amazing but I am not too educated in the electronics. I would love to see how this is all mapped out with the connections between the UPS batteries etc. I currently have a system that will get me by with little. 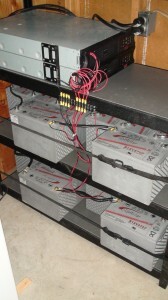 I have four Walmart Marine 115 amp/hr batteries hooked up in parallel. I have a 40W panel to trickle charge them with a 30 amp solar controller. Any suggestions on how to utilize the UPS with this system? There's not a quick answer to this, but we use a UPS system here at our home. I'll have to get more written on this at a later date. The panels that Scott recommends are roughly $.53 a watt vs. the sunelec panels that are now $.74 per watt. Thanks for this article! This is exactly what I need and now all I have to do is get my electrical-engineer-daughter to wire it up. I loved this article. Clear, concise and well illustrated. Thanks for all you and Scott do to keep us informed. I've been following you long enough to know I can trust the information you put out there and that in itself is *priceless*. This article is great, thanks so much. I wonder if there is any website at all that would give a photo of a home that looks roughly like this would look. The reason that I ask: Beside the idea of going off the grid, I wonder about the opsec piece. I don't anticipate living any place that is truly rural, and I wonder if everything hits the fan, how hard this will all be to guard. Thanks for any input here!! Kellene, I keep seeing references to a follow-up article with more details related to the home solar system being mentioned but I've not seen anything since this first article came out. A follow-up would be very helpful for many of us...any idea when this might be? I'm not sure what you're referencing. I didn't write this particular article that you're commenting on. This would actually be the article I'd direct someone to regarding a home solar system. It's definitely not my forte'. "...This article will include the basics of building a system, and future articles will include more in-depth information about the nitty-gritty details". This is in the very first paragraph of the article. The introduction to the article also says "...I've also got to include a follow-up piece on how to assemble the solar panels. Enjoy!" Excellent article. There is one technical detail that should be corrected for safety. This paragraph - "but 10 or 12 gauge wire connecting each bank of batteries to the UPS system is fine since the system is limited to supplying (drawing from the batteries) no more than 20 amps at a time." The UPS at full power will be providing 1920 watts (or 120v at 16 amps). For the batteries to provide the 1920 watts with the wiring configuration set for 48 volts then the current required will be 40 amps. 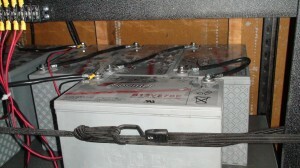 To avoid any safety concerns the wiring from the batteries to the inverter should be a minimum of 8 gauge copper wire. Thank you for the very helpful article. The resourcefullness of using UPS systems is very creative and can save a lot of money. Good catch, Tom! You could go to 8ga wire. What I prefer to do (and what I meant to include in the article) is to run 10-12ga wire but to run multiple sets of it in parallel. You can see what I mean in the pic that shows the internal battery bank with the wiring running through the front panel. I also put inline fuses on each positive wire coming from the battery bank so that I don't run the risk of overloading any particular wire. I can't wait for part two...hint...hint! I am buying land in the country and want to be totally off grid. Make friends with the search bar on here. It will be very helpful to you, I'm sure. Or you can focus on specific Principles of Preparedness by clicking on one of the 10 icons that are rotating in the upper right portion of this page or that are listed at the bottom of the page. Click on the principle that most interests you and you will get the articles written under those particular principles. I think your article is great but I've read articles about why you can't build your own solar panels. They say the panels have to be incased in resin or they will fog up and become useless. Allso that they will not weather well. Is this true of the glass and frame panels you built or is this just negative advice from people who don't want you to do it yourself ? When my husband makes ours he pours a liquid encapsulant over the panels, carefully so as not to create air bubbles. This is a liquid resin. Do you know were Scott gets his resin from and how much it is? I've heard it's really expensive and hard to keep out bubbles. thank you by the way Scott has answered a lot of questions I had. Thanks so much please keep me posted on part II. I will be starting this project shortly. We just survivied sandy, and will be doing the whole project from start to finish ourselves. we are were also thinking of making a quick disconnect system for removing the panels prior to a major hurricane. two reason a they might be damaged by flying debree and second a tree could fall on them. in which case the panels would be safe inside the basement up off the ground as we do not have to worry about flooding being on the top of a small hill. we will be exploring the cost of covering our panels in glass and resin. ; any comments or further suggestions would be great. You're looking for deep cycle batteries. They can be from windmills or boats or even some of the smaller airplanes that people build. You can buy them used or new. Well said, but everyone needs to appreciate that adding Solar to their house is an asset that will increase the actual valuation of their building if / when they decide to sell. With the environment the way it is going we simply cannot dismiss any item that delivers no cost power at no cost to both the buyer and more significantly the earth! So solar panels would not have to be 'protected'? I think the large batteries are also 'safe' as they are just large lead plates? Kellene, How would solar panels and wiring withstand an EMP? Is there some way to protect it? It seems to me that we need a HUGE Michael Fairaday box to hold all the things needed when an EMP happens. Anything with diodes would be destroyed. So the inverter/conversion box is what you have to be concerned with. Any thoughts of putting this in a book with the second part including diagrams and pictures? I will be the first to buy this. Thanks for all the info. Now it makes sense. (post ups ac) <inverter> dc <inverter> (utility grid). Would that work? Great article sir. I been researching for renewable energy systems especially solar power and your article just hit me. I have a little background in electrical and electronics work and I want to try your set up. At least start with the 20 amps system for refridge, computer and couple of lights. I don't know if we do have exact component here on Guam, but I'll look around. What I know is we have sunlight almost all year round. Do you have a block diagram for this system that I may use for reference? Thank you. Would REALLY love to see a wiring diagram on this. Not sure how the power from the TS-60 gets into the battery packs. Isn't it a direct connection to the batteries? If so, are you plugging the UPSs into the utility outlet and then the output from the UPSs routes back into the utility power? DIAGRAM DIAGRAM PLEASE! !